SYRACUSE, N.Y. - New York Governor George E. Pataki gathered with other elected officials and trustees from the SUNY College of Environmental Science and Forestry (ESF) earlier this semester to discuss his $2 million capital improvement plan for the State University of New York. Included in the plan is the $14.8 million renovation of the college's Hugh P. Baker Laboratory, home to the Faculty of Construction Management and Wood Products Engineering. The state also earmarked $1.4 million to increase the college's distance learning capabilities and about $4 million to rehabilitate the college's Ranger School in Wanakena. Among the dignitaries present when Pataki made the announcement were members of the ESF board of trustees. The trustees are Thomas C. Burkly of Cazenovia, president and chief executive officer of Stearns and Wheler Environmental Engineers & Scientists; Heidi J. Busa of Skaneateles, an ESF alumna aand teacher who chairs the science department at Marcellus High School; and Robert E. Moses of Marietta, an attorney who is a partner in the Bond, Shoeneck & King law firm in Syracuse. 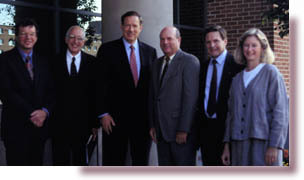 Pictured, from left, are Daniel T. Fitts of Lake Placid; ESF President Ross S. Whaley; Governor George E. Pataki; Thomas C. Burkly of Cazenovia; Robert E. Moses of Marietta; and Heidi J. Busa of Skaneateles.